Published: Oct. 1, 2017 at 06:50 p.m. 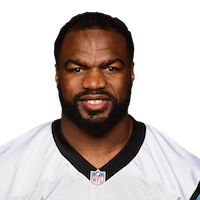 Published: Aug. 31, 2017 at 08:43 p.m.
Carolina Panthers running back Fozzy Whittaker scores 4-yard touchdown against the Pittsburgh Steelers. Published: Sept. 18, 2016 at 02:33 p.m. Published: Sept. 18, 2016 at 02:21 p.m.
Carolina Panthers QB Cam Newton pitches to running back Fozzy Whittaker for a 19-yard gain.